Father Stavros Papagathaggelou was born on the 25th of March 1911 in Agia Varvara. Both, his father, Father Agathaggelos, who was the minister of the village, and his mother, Sophia Hadjisavva Souroupi, brought him up with Christian faith and love. His parents were his “first educators”, and through their lives they taught him to be respectful, laborious and loving towards his neighbour. Father Agathaggelos imprints the warmth and the “educational atmosphere” of his family home through his poem “To spitaki mas”(Our little house). and His will we have as light. “Just as I had finished primary school, my desire to serve the Church convinced my honourable father, although he was very poor, to sent me to the Pancyprian Theological Seminary”. “When I finished (the Pancyprian Theological Seminary), I worked for about a year at a commissioning office and later on, being young, I was appointed as principal of the Greek School of Alexandretta….My desire to serve the Church from the inside, since the cowl was not only endeared to me but extremely endeared in sight, since my memorable Father used to wear it, I rushed at the age of 27 years old to enter the holy clergy”. 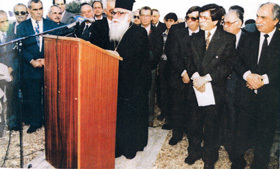 As a minister, as it is mentioned in the project done by the children of the community’s primary school, “he served at the Holy Church of Agios Ioannis (Saint John’s Church) of Lefkosia, at the Holy Church of Phaneromeni, at the Metropolitan Cathedral of Athens and at the Agios Nectarios Foundation”. Almost instantaneously, he founded the Orthodox Christian Youth Union (ΟΧΕΝ in Greek). He was also one of the founders of the Pancyprian Organization for Religious Orthodox Foundations (Π.Ο.Θ.Ο.Ι. in Greek). Later on, in 1945, he founded the Nighttime School of the Orthodox Christian Youth Union and afterwards the Afternoon School for the Working Girl. A year later, in 1946, with the help of his associates, he organized the First Charity Market of Lefkosia which was addressed to the children of the Catechetical Schools. Before he was ordained, he got married to Ioanna Constandinou Eftechiou. They had five children. Father Stavros characterized his wife as “his faithful companion in his life and spiritual course”. From 1949 to 1950, he studied at the School of Preachers, Confessors, and Catechists of the Greek Church. Father Stavros transmitted the light of “God’s Grace” to thousands of faithful people. Hundreds of faithful people managed, under the guidance of the enlightened priest, to be reborn spiritually. Father Stavros, “was distinguished as a spiritual father” of many children of the Church, through the Holy Communion of the Sacred Confession. His writing and musical work is equally “rich and diverse”. Father Stavros, as it is noted in the book of Maratheftis I. Michalakis,” wrote fourteen books with poems about childhood and youth, prayers for the children of all Primary School grades, texts for the Holidays of the Orthodox Church and Saints’ biographies. MORFES POU AGIASAN TIN KYPRO (FIGURES WHO SANCTIFIED CYPRUS). SINTROFIA ME TOUS AGIOUS (IN COMPANY WITH THE SAINTS). GNORIMIA ME TIS GIORTES MAS (GETTING TO KNOW OUR CHRISTIAN HOLIDAYS). PSALMOI KAI MELODIES TEFHOS A’ (CHANTS AND MELODIES, FIRST ISSUE). DEN XEHNW ( I DO NOT FORGET). IDRIMA PAPASTAVROS PAPAGATHAGGELOU (PAPASTAVROS PAPAGATHAGGELOU FOUNDATION). A special place among his works holds the book “Morfes pou agiasan tin Kypro (Figures who sanctified Cyprus)”. In this book, one can find the biographies of sixty Figures of Orthodoxy. The musical work of Father Stavros consists of six books. According to Maratheftis I. Michalakis, these books “include his own original musical composings or dispositions of religious hymns in Byzantine or European musical notation.” Most of the melodies are accompanied by verses written by him. These verses are enhanced with lyrical elements, “full of love for God, human and nature”. The songs of Father Stavros were sung “by the youth of Cyprus in Catechetical Schools, in Camps and in the hiding-places of the fighters of E.O.K.A”. disaster and pain on it. and full of shame they left. The contribution of Father Stavros for the awakening of the Orthodox Greeks of Cyprus during the years of the British occupation was extremely important. In 1952, he founded the Revolutionary Organization “KARI (in Greek)” – Cypriot Fighters Risky Leaders, in cooperation with Doctor Ioannis Ioannides Hadjipavlou, manager of the Children’s Hospital. Afterwards, this particular organization was integrated into E.O.K.A, the National Organization of Cypriot Fighters. At the same time, he assumed the writing of the secret revolutionary bulletin “ENOSIS”, which stopped being published when the liberating fight against the British colonizers began. During the National Liberating Fight, Father Stavros was the fiery recruiter of the E.O.K.A. fighters. The first fighters to be initiated to the fight came from “OXEN”. Father Stavros, as Maratheftis states, “put hundreds of fighters under oath, some of which were either killed singing his own war-songs or walked with a brave soul towards the platform of the gallows of the Central Prisons. In 1956, the fiery priest was exiled to Seychelles along with Archbishop Makarios III, the Metropolitan Bishop Kyprianos of Keryneia and Polykarpos Ioannides. A year later, they were released and lead to Athens, where they were proclaimed honorary citizens. 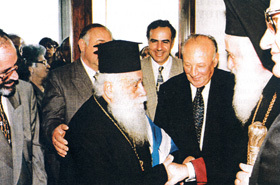 In 1989, Father Stavros founded the aforementioned Papastavros Papagathaggelou Foundation. It is a foundation with spiritual and charity purposes. The priest offered the foundation a community piece of land as well as the copyrights of all his books. Additionally, he built up a Chapel dedicated to Agios Nectarios, on this piece of land. In 1995, a nursery school was built on the same property for the children of the community as well as for the children of the wider region. The school began its operation on 28 December 1997. 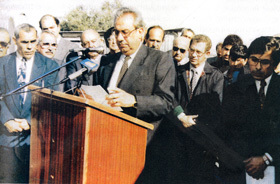 During the school’s inaugural ceremony, Father Stavros expressed “his noble vision and holy desire.” Undoubtedly, the construction of the nursery school constitutes one of the most important projects that have ever taken place in the community, since it has offered invaluable assistance to working mothers. Father Stavros spent the last years of his life in the company of his wife, in his beloved village, Agia Varvara. 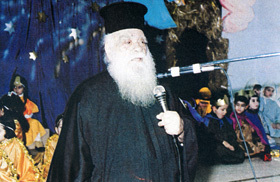 Father Stavros passed away on 10 May 2001. Included in the funeral speech pronounced at the Holy Church of Agia Varvara, was an extract from the beloved priest’s speech. In this extract, which is cited in translation below, emerge the feelings of Father Stavros for the course of his life. “Life has not always been sweet and peaceful… Thousands of glasses full of bitterness… We went through the furnace of sorrow and the ocean of troubles…. However, in the end, the mercy of our Great God lead us to a place of recreation and comfort. Now standing with His grace along with my wife- I truly owe so much to her- in my village, Agia Varvara. In the village where I first saw the light of life, I prepare myself for the great departure towards Life. I march to continue chanting the name of the Lord there as well, “the praised, and glorified through the centuries”. in the embrace of God. Father Stavros we love you, and we will never forget you. Project by the 6th Grade children of the Agia Varvara Primary School, “O flogeros iereas tou choriou mas (The fiery priest of our village)”, 2005-2006. The extracts from the speech of Father Stavros Papagathaggelou are taken from the “Omilia kata tin kideia tou Papastavrou Papagathaggelou (Funeral speech during the memorial service of Father Stavros Papagathaggelou)” in Maratheftis I. Michalakis, Iroikoi Apoihoi tou ’55 (Heroic Resounds of 1955), Lefkosia 2006. “Papastavros Papagathaggelou: O Agonistis tis Orthodoxias kai tis Patridas (The Fighter in favour of Orthodoxy and the Country)”, in Maratheftis I. Michalakis, Iroikoi Apoihoi tou ’55(Heroic Resounds of 1955), Lefkosia 2006. 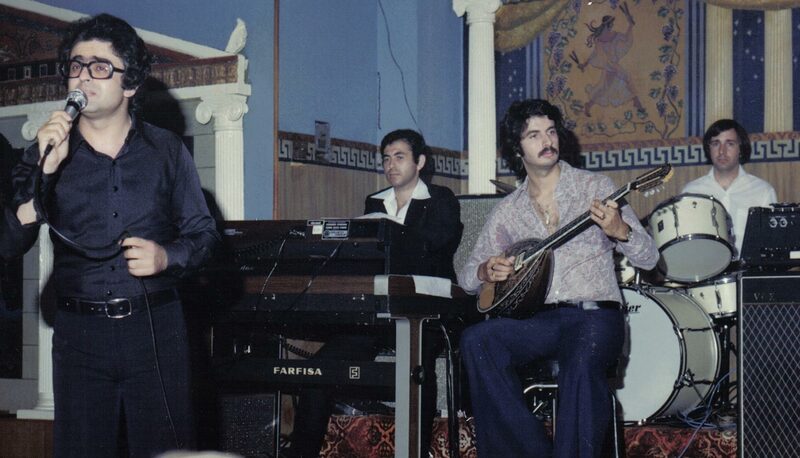 The renowned Cypriot singer and composer Michalis Violaris comes from the village of Agia Varvara. He was born in 1944 in a family whose members were related to music as his grandfather used to play the lute, whereas his father was a psalter and violinist. Today, he lives in Athens. As a child he attended the National Conservatory of Larnaka and after graduating from Gymnasium in 1962 he went to Athens to study literature. 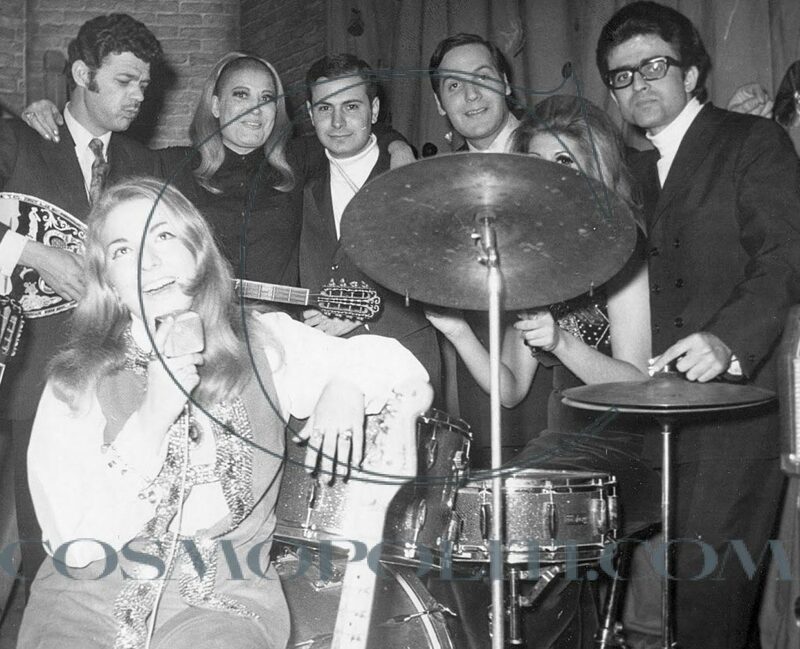 During that time he also started taking courses at the National Conservatory of Athens. 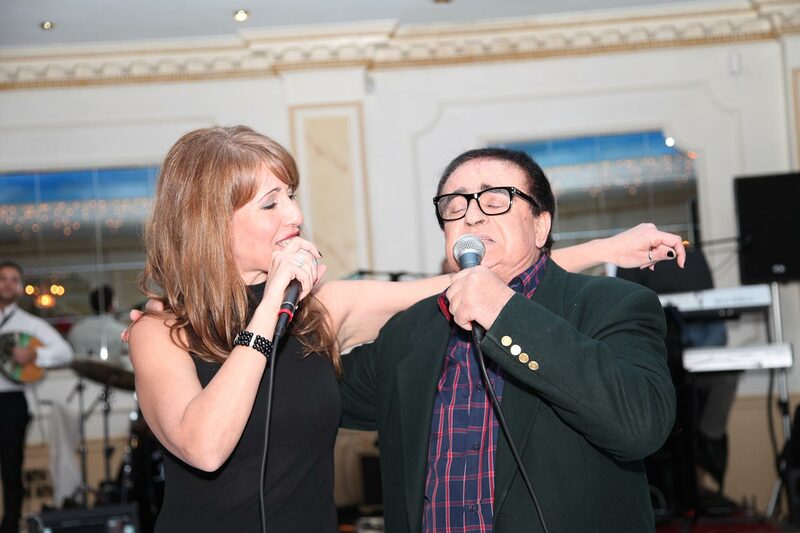 Next, in cooperation with Soulli Sabah, he presented his own compositions, which were followed by songs written in Cypriot dialect. He sang both his own and other composers’ songs which became hits. 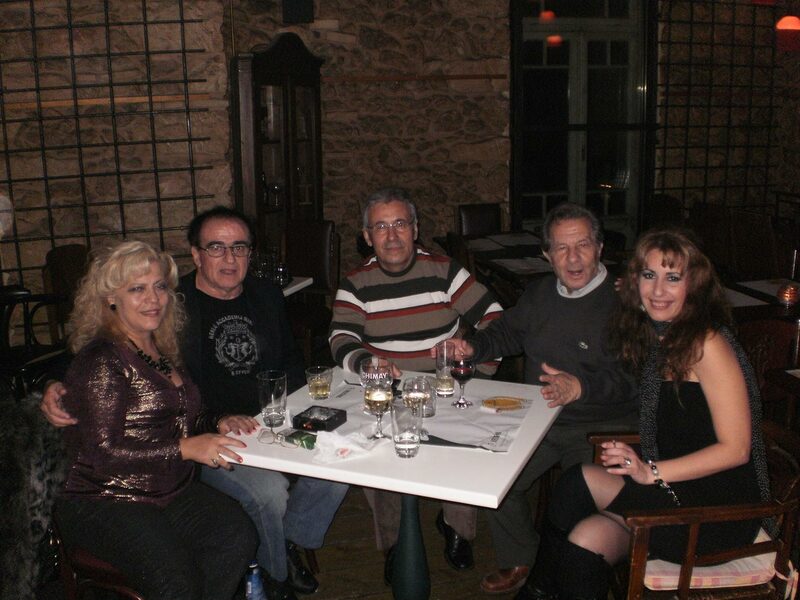 He performed on small stages, concerts and tours and participated in Greek movies.